Why are you on this page? Did you bookmark it? Tsk, tsk. Don't you know the new website is coming online? Check out www.joelipe.com. 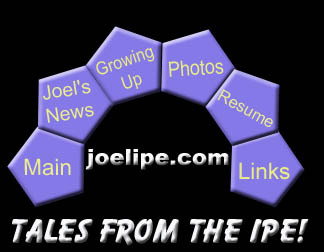 Has it really been nearly 6 years since I started joelipe.com? Really? Six years? No wonder I'm so tired. I have some good, better, and best news. Good news: I've started working on the last 20+ days of photos since May, including visiting the Philadelphia Zoo, and our trip to Ocean City. However, as I started editing photos, I realized this was going to take forever. If you remember from yesterday's entry, I was now debating using a 3rd-party service to save myself some time, at the lost of some customization. I've selected Google's Picasa. It seems to be the best course of action to outsource at this stage. Why do I need to spend so much time manually resizing photos, creating thumbnails, and adding to tables? Better these days to automate and save those blood, sweat, and tears for..... everything else to do around here. Better news: I've already converted May 2008 photos, and I've put a temporary link on the Photo Gallery page until I figure out how I'm converting this all. I've started uploading June 2008 as well. I'm eventually planning or just considering converting all of 2008 at this stage. I'm thinking that I'll stop breaking out all the photos by categories (Family, Friends, Trips, etc.) It became a little annoying when I had 2 photos in the Friends category, and 39 in the Family category, and keeping track of dates. Now, I'm just going to group it all by month. Best news of all: What the hell, this site is due for an overhaul. I'm going to slowly redesign the site using css again, and dust off the old prototype template. I'm not going to touch the archives, but going-forward, time for some fun. What a busy few weeks it has been. Long story short: the audit continues. Enough said. Last Tuesday, I had to be in Long Island City for a 7am meeting. Since we live in central NJ, it took some thought to figure out the best way to get all the way to Queens that early in the morning. I decided on taking the train from Princeton at 5:19am, which worked out fine, as I walked into the building lobby by 6:45am. Of course, the visitor desk isn't manned until 7am, so I had to hang around in the lobby for an extra 15 minutes. I miss commutting by train, but my goodness, $10 one way, off-peak. If I was taking the train to a job in the city regularly, even with a monthly pass, I think it would cost me nearly $500 a month. That's a lot. I recently upgraded to Firefox 3, and it's pretty good so far. I installed a cool extension called PicLens which lets you view photos and movies in a free-flowing wall of media, similar to Apple's CoverFlow. You can also zoom in and out as you search, and activate movies to watch them right then and there. Check out the website. It also works on the Flickr, YouTube, etc. I think it's neat. Having finished Good Night, and Good Luck last week, we're now watching Entourage Season 1 through Netflix. What a great show. We've finished the first four episodes, and waiting for the next four. I have so many photos and videos to upload, I don't even know where to begin. :( Maybe I should finally concede to move to a Flickr or Google Picasa or other service. This past weekend, we made a family trip to Ocean City, Maryland for a little well-deserved (and impromptu) 3-day family vacation. We stayed at the fantastic Hilton Suites Ocean City Oceanfront right on the beach, with a great room -- bedroom, full-size kitchen, living room, 2 sets of HDTV plasma TVs and upscaling DVD players, and balcony overlooking the beach. Multiple pools, and did I mention right on the beach? I didn't particularly find the cuisine in Ocean City all that great, but it's a resort town with lots of seafood buffets. Not quite my cup of crabcakes. I had meetings in Long Island City today, so I took the early morning bus to NYC, and the subway to Queens. Man, I've gotten spoiled commutting to the office by car. Just to get to the city by mass transit involves waking up super early, sitting in traffic, and spending way to much money to get a decent sandwich for lunch. Speaking of lunch, our friend Lesh recently started a new job in Long Island City, so I met up with her for lunch. That was cool, because it gets trite to eat at your desk (actually, it was someone else's desk) all the time. Yea, they're here. The dishwasher and range hood are here and installed. The kitchen is about complete, except for the gas range/oven. We've selected a plumber, and we're ready to get the work done. Hopefully we'll be cooking with gas in early July. Then, I will fire up the gas range, and proclaim, "Now we're cookin' with gas, baby!" We finally finished watching Good Night, and Good Luck starring an all-star cast -- David Strathairn, George Clooney, Jeff Daniels, Robert Downey Jr, etc. Did I mention that our gas stove arrived early? Yeah, it did, but the dilemma is that we don't have a gas line in the kitchen, so we're in the process of having plumbers come to the house to price out the work effort. We also need to submit work permits to the township to get approved for the work. From my discussions with the township, we're looking at a couple of weeks until the permits are reviewed and potentially approved. For the moment, the new gas range is sitting ingloriously in our dining room for the forseeable future. Sigh. Thankfully, the new dishwasher and range hood have no prerequisites, and will be installed next week. Today we made a field trip out to Bucks County, Pennsylvania for a little BBQ. Specifically, Shady Brook Farm was running their annual Festival on the Farm. First time attendance, but I've been pushing for more exploration of Pennsylvania as we live so close. It was three days, but we braved the heat on only Saturday. The festival involves a strawberry festival, kiddie carnival, backyard bbq competition, but it was the BBQ that piqued my interest. It was a hot day, and we ended up camping out under a tent. Still, it was nice to get out for a while. Now that the heat has arrived, Josh and I have been hitting the community pools in our neighborhood to keep cool. One thing that I like about our community are the facilities in close proximity -- 4 pools, multiple playgrounds, two elementary schools, shops, etc. Definitely a plus. So tired. This past weekend was busy, to say the least. First off, it was "the Mancation." My friends Doug, Paul, and Sean, and I travelled to NYC for a weekend in the city to hang out with each other again. We stayed at The New Yorker hotel down on 8th Ave and 34th St. Friday night after work, I drove out to meet them in the city. Saturday morning, Nums and I (and the kids) drove to south Jersey for my sister Julie and Robbie's housewarming. Later Saturday evening, I drove back to the city to meet up with the guys again. We had steaks at Gallagher's on West 52nd st. After dinner, we proceed to Greenwich Village for a traditional pub crawl. Around 4am, we called it night, and I stayed over at the hotel. Sunday at noon, we checked out and headed up to midtown to have lunch at the Carnegie Deli, and try to take Sean to see Grand Central Terminal for the first time. There was a "Israel at 60" parade, so the streets were packed, and I couldn't get parking. I was about to park in a garage on 54th when I got rear-ended by someone in a Jeep Cherokee. My bumper got all messed up, and I was depressed. We exchanged information, I parked in the garage, and met up with these guys for lunch. We couldn't make it into Carnegie Deli because of the wait, so we ate at the Stage Deli. Uh, I like pastrami as much as the next guy, but $15 pastrami sandwiches? Are they out of their minds? In the afternoon, we dropped Doug at Penn Station, and I drove Paul and Sean back to our house to see Josh and Lily. In the evening, I drove them to Newark Airport to catch their flight back to Michigan. This is a Flickr badge showing public photos from Joel. Make your own badge here. Decent movie and well-active? Sure. Was it really worth making it into a feature film? I think not. Short, and better suited as a tv movie of the week, clocking in at a brief 90 minutes.